In 1926, Agatha Christie disappeared—making headlines across the world—only to show up eleven days later at a spa under an assumed name. During those eleven days, did she have time to write a play? THE CHRISTIE CURSE, Book 1 in the series, introduces us to Jordan Kelly Bingham, a resourceful twenty something looking for a respectable job. She finds such job - with room and board - with Harrison Fall's resident grump, Vera Van Alst. 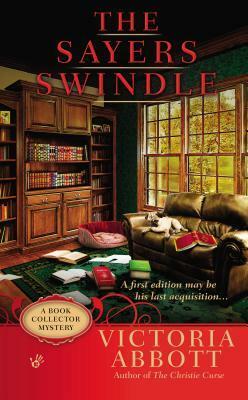 While her vintage mansion crumbles around her, Vera collects first editions from her favorite mystery authors. She tasks Jordan to procure a copy of the Christie's "lost play" .... and Jordan turns to her not-so-respectable uncles for assistance. As Jordan hunts for the lost play, she learns that not all of the players in the rare book business are who they seem to be. Abbott creates a cast of characters who are entertaining and intriguing - a research assistant with gusto, a male librarian on speed dial, an Italian cook with endless energy, several uncles with unlimited resources, and a mysterious cop with a killer smile. Abbott incorporates the Dame's plot devices into THE CHRISTIE CURSE as a tribute to her. 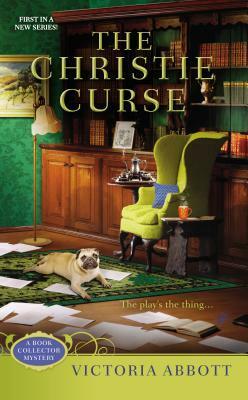 THE CHRISTIE CURSE kept my attention throughout its 304 pages. I was curious enough to find more books in the series. 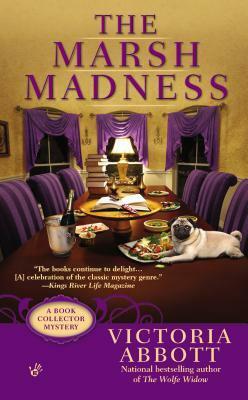 THE MARSH MADNESS is Book 4 in the series (I did not find Books 2 and 3 at the used book store). The same characters welcomed me back to the cozy (but chaotic) world of Jordan Bingham as she balances her "respectable" job while relying upon her "questionable" uncles for assistance. In THE MARSH MADNESS, Jordan finds herself on the opposite side of the law - and her police boyfriend - as she tries to clear her name in the suspicious death of an reclusive millionaire. THE MARSH MADNESS delivered more laugh out loud moments as Jordan morphed into Stephanie Plum meets James Bond - one scene involves her cop boyfriend chasing her with only a towel after he stepped out of the shower to find her hiding in his house. Jordan has gained more confidence in herself while she finds it easier to blur the lines between "being above board" and "bending the rules." The cherry on top - Jordan shares her love for Ngaio Marsh books, making them a part of the plot in unexpected places. The villain is not who I expected. Jordan has been able to swing a romantic trip to San Francisco with Officer Tyler “Smiley” Dekker on one condition—she must return with a rare copy of Dashiell Hammett’s Red Harvest for her irascible employer, Vera Van Alst. For his own part, Smiley is full of surprises. He’s a Dashiell devotee himself—excited to be in the city of Hammett’s hard-boiled heroes like Sam Spade and the Continental Op—and also announces he plans to visit his previously unmentioned estranged grandmother, who lives in an old Victorian on Telegraph Hill. 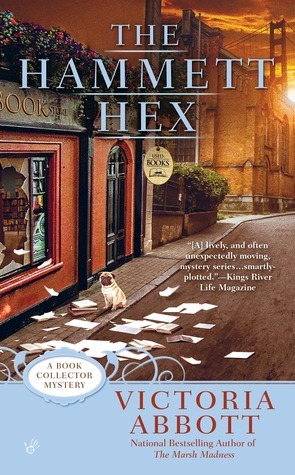 THE HAMMETT HEX is Book 5 in the series, picking up shortly where Book 4 ended. Jordan and Smiley escape to the City by the Bay only to find themselves embroiled in a series of near escapes - are they trapped in a Dashiell Hammett novel? Nothing stops them from fulfilling Smiley's secondary purpose of visiting San Francisco - reuniting with his estranged grandmother. Yet that simple meeting leads to more chaos for Jordan and Smiley. Why does trouble come her way every time she procures rare editions? Jordan demonstrates that she is more than capable of taking care of herself while dodging villains. She relies on the Kelly Family motto - make do with what is handy. Her antics leads to laughs as well as endearing her to me. I rooted for her through thick and thin. I did not want THE HAMMETT HEX to end. Now I have to find Books 2 and 3 in this series ... and hope Victoria Abbott continues to publish the adventures of Jordan, Smiley, and the Kelly Uncles! 1. Have you visited San Francisco? If yes, what was your favorite thing about the City by the Bay - view, food, experience? If no, what would you want to do? I have not visited San Fran yet .... I would like to ride a cable car! 2. Comments are open through Wednesday, January 31, 10 pm in Baltimore. 3. I'll post the winner on Thursday, February 1. 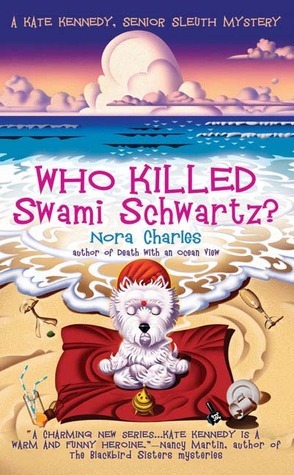 I found Nora Charles' DEATH WITH AN OCEAN VIEW at a used book store before my trip to Florida. 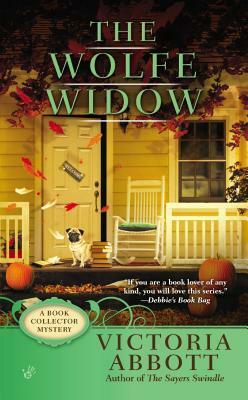 Published in 2004, it is the first book in Senior Sleuth Mystery series. Given I grew up in Miami, I enjoy reading novels set in South Florida. The story opens with Kate Kennedy lamenting the death of her husband, a retired NYPD officer. He died shortly after they signed for their new home in the Ocean Vista condo building overlooking the Atlantic Ocean. I almost gave up as Kate was drowning in her grief. Then the pace picked up with the murder .... and Kate's sister in law, Marlene, engages in senior antics. Kate and Marlene become Ocean Vista's version of Lucy and Ethel as they investigate the murder. 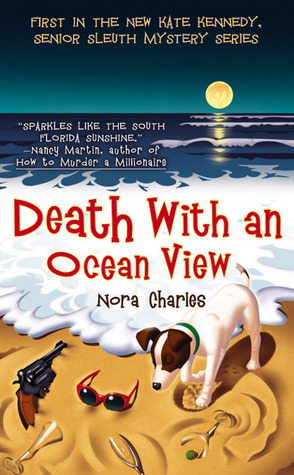 DEATH OF AN OCEAN VIEW is only 198 pages - a quick read that produced many chuckles as Marlene reeks havoc on the retirement community while Kate acts as the level headed sleuth. 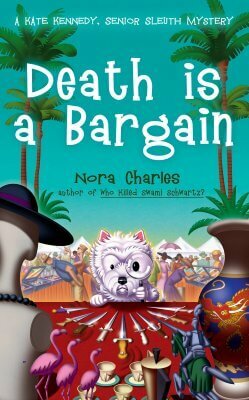 In the end, Nora Charles' created memorable characters to cherish. Her dry wit is the cherry on top. He forecasts the weather on TV to the delight of his many fans. But the residents of Ocean Vista Condominiums are less fond of Uncle Weatherwise—the newest arrival at the condo—especially when a hurricane that he predicted would bypass Palmetto Beach instead heads straight for their town. 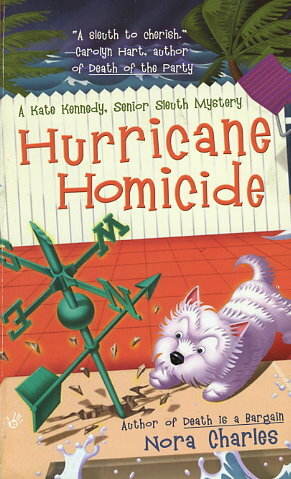 The morning after a frantic evacuation, Kate is blown away when she stumbles upon the corpse of Uncle Weatherwise, with a sharpened weather vane pointed in the direction of his heart. Suddenly Kate’s neighbors are her suspects, from a retired Rockette to a former federal prosecutor to a man dressed mysteriously in crisply pressed pajamas. And before she knows it, Kate is hot on a trail of clues that may lead back to the Cold War. HURRICANE HOMICIDE (aka DEATH STORMS THE SHORE) is Book 4 in the series. Nora Charles turns up the cloak and dagger with flashbacks to the Cold War. The memorable characters continued to entertain as I pieced together how the Red Scare of the 1950s could still impact lives in their twilight years. Nora Charles accurately portrays the chaos of hurricane evacuations - something I remember vividly from my childhood in Miami and college life in Tampa. But catching waves can be a dangerous pastime. When Katharine’s surfer crush is killed in a shark attack, foul play is suspected, especially by the police. Fingers are pointing at Katharine—including, to Kate’s disappointment, those of her friend Detective Nick Carbone. It’s up to Kate to prove her beloved granddaughter’s innocence or else Katharine’s “new life” will be spent behind bars. 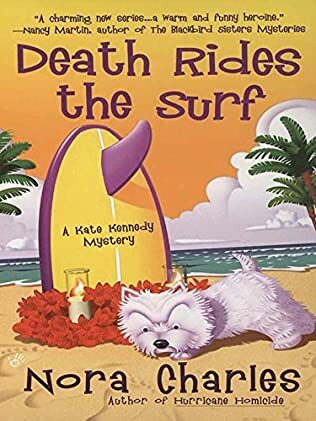 DEATH RIDES THE SURF is Book 5 in the series. Kate's impish granddaughter Katharine, creates waves in Ocean Vista as she follows her heart to a group of disreputable surfers. As Kate walks the fine line of offering support while encouraging Katharine to act responsible, Marlene breaks the ice for the dynamic duo solve the mystery with a little help from Casablanca. I am now on the hunt for the two books I missed in this series! 1. Leave a comment about where you would like to retire - beach? mountains? countryside? You know my answer .... Hawaii! Even if we landed in the middle of Oahu, in the pineapple fields, I would be happy!